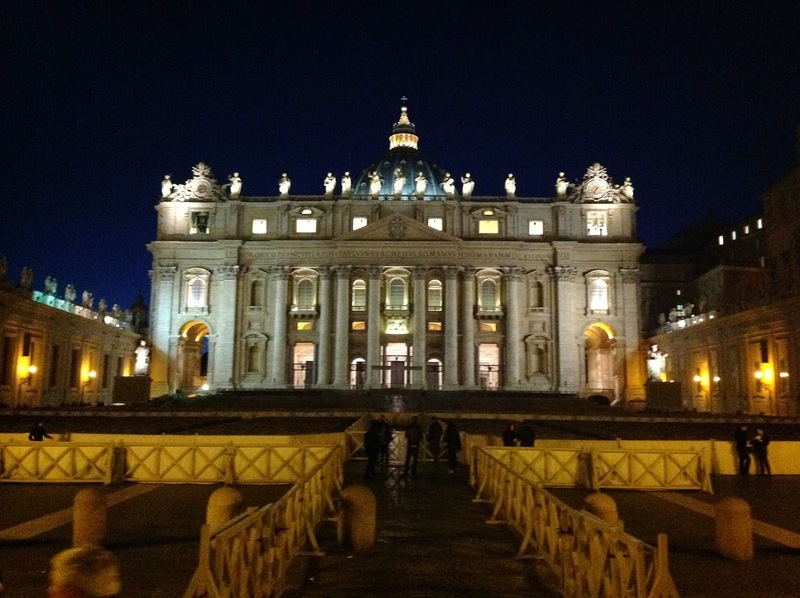 Bonfire of the Vanities: Cardinals flock to Rome -- and I'm there! With this post I'll finally catch up to the present. 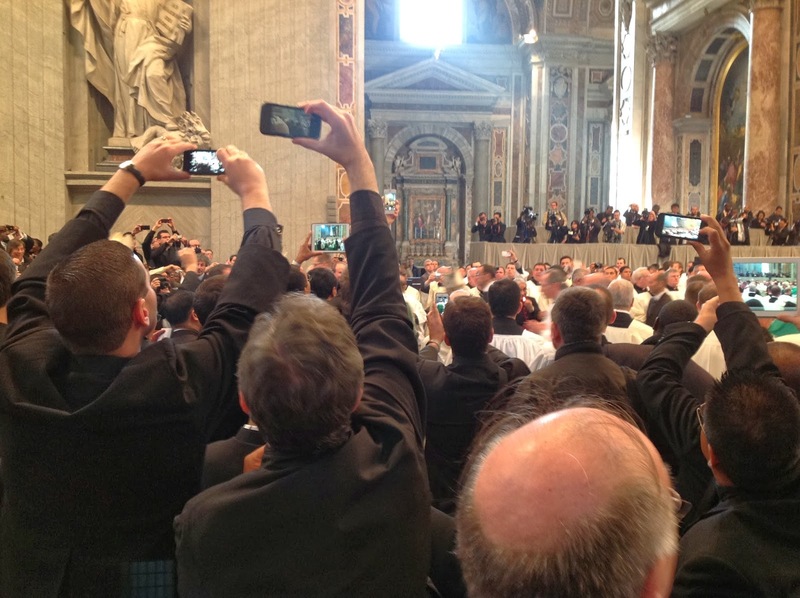 I actually returned from my Saint Paul pilgrimage on Friday; Saturday was a lazy day for your correspondent, while about two miles away, the holy father conferred red hats on a number of new cardinals, and then met with the whole college. There are a couple of customs associated with this day, which was also the Feast of the Chair of Saint Peter. One is that the apostolic palace -- where, until Francis, the pope would live -- would be opened for visitors, and the new cardinals would greet people there. 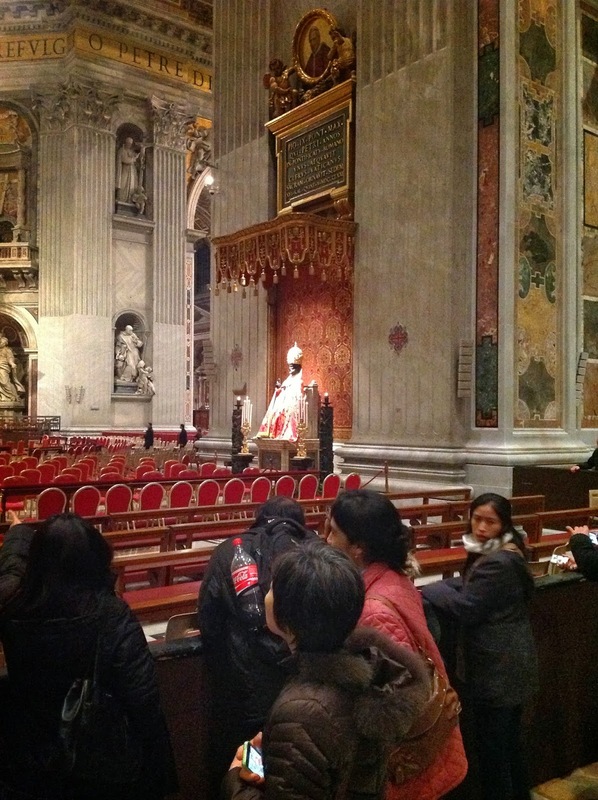 The other is that Saint Peter's Basilica would be especially decorated for the feast day. The church was decorated all day, I believe; but the greeting of the faithful went from 4:30 to 6:30 pm. 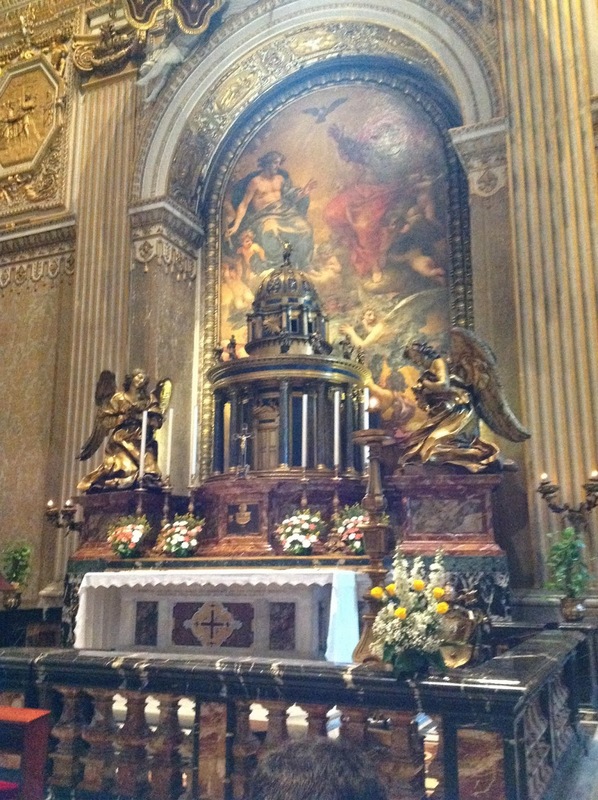 One of the priests joining me in Rome is also from Cincinnati, and we decided to head down to the basilica at 5 pm. In all candor, meeting a cardinal wasn't the main thing. No offense to their eminences -- but they want to greet their families and their fellow contrymen; none of the new cardinals are American. 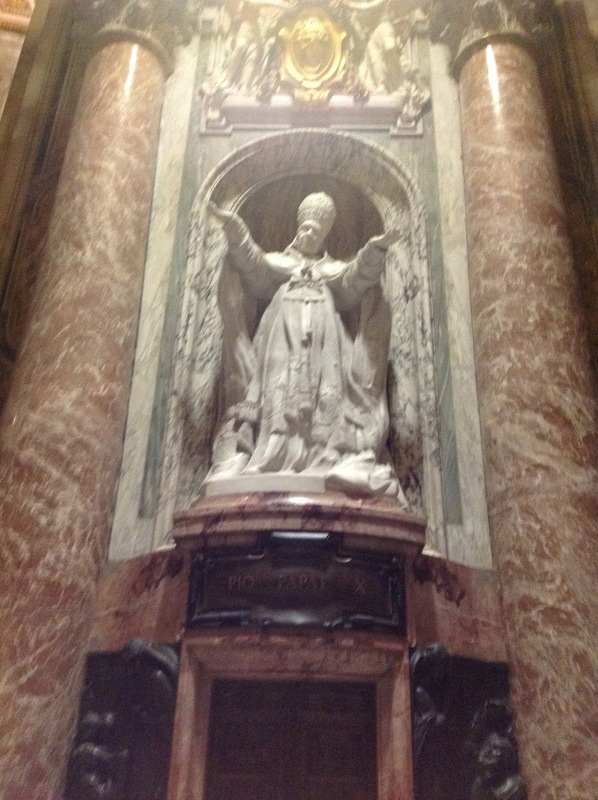 And while Father R. and I were willing to check out the pope's former digs, we mainly wanted to visit the basilica and pay our respects to the first pope. So, we got in line, and we talked awhile to pass the time. Then, realizing we might not have much time, in the basilica, to pray our office, we each got out our electronic devices and prayed our prayers silently. 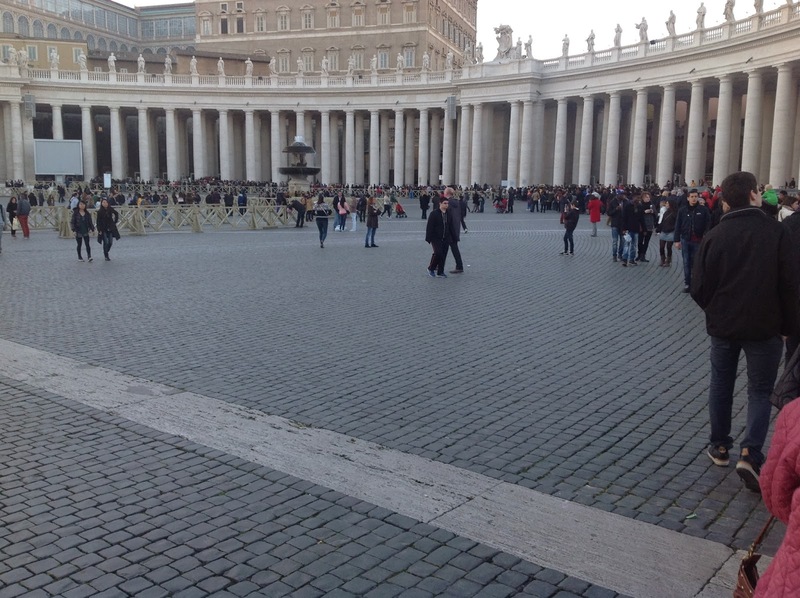 As a result, we were praying when we reached the point where the two lines diverged -- one for the basilica, and one for the apostolic palace. Only later did we even realize there were two lines; and when Father R. complained, "why didn't they have a sign?" I sheepishly pointed them out, now behind us, and admitted I'd seen the signs, but hadn't really paid attention. Now we found ourselves stuck in a still rather slow-moving line...for the basilica! -- while the line for the palace seemed almost non-existent. But appearances are deceiving; what we actually saw were the lines to different sets of metal-detectors; we realized, just beyond, the lines resumed; only now, the line to greet the cardinals was stalled, while the basilica line evanesced. We opted to stay where we were; but it meant that we now had to give up on visiting the papal apartments. That doesn't give you much of a view, does it? Here's a close-up (you didn't know I could do whiz-bang things like cropping photos, did you? Ha!). You can't really tell, but there's a giant chair there, amidst all the candles. You never know when you'll need a spiffy image of Pope Saint Pius X, right? Then, around 6:20 pm, the guards -- in their inimitable, Roman courtesy, very patiently yet insistently shooed us toward the doors. I thought we'd be safe sitting in the front portico, but no! They shooed us all the way out to the piazza. 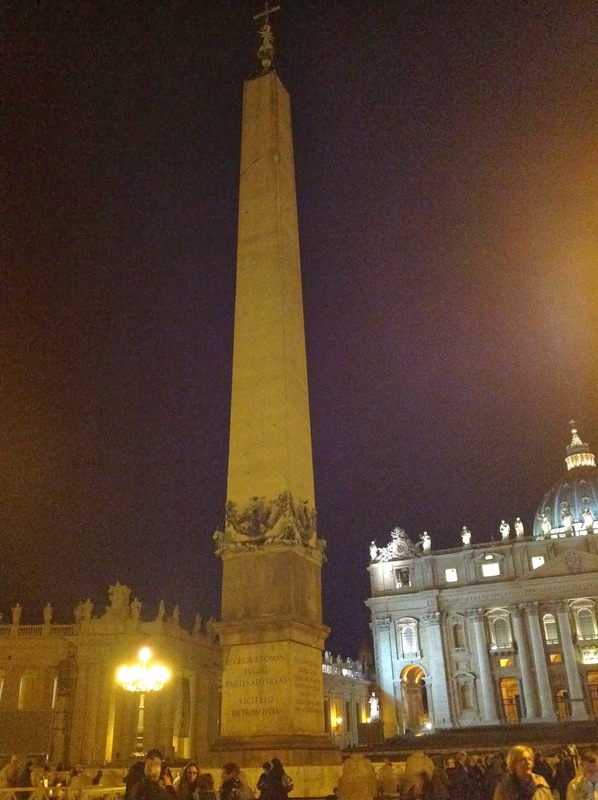 Father R. and I had made plans to meet another Cincinnati priest at 7:15 pm, at the base of the obelisk at the center of the piazza; but as it was 6:30 pm, the other priests opted to head back up the Janiculum Hill to the residence for a 7 pm dinner. Meanwhile, in all the shooing-out, Father R. and I were separated. So I wandered around the square a bit, finding my way to the obelisk. There's a great story about this, but I only know a few bits and pieces. Here's what Wikipedia says, and who knows? It may even be mostly true. Still no Father R.! Finally, around 7 pm, he sidles up -- and claims he was merely wandering around. But I know I'll never get the truth out of him. Soon, our friend -- another Father R.! Call him Father RR -- shows up, and leads us through a maze of streets to a restaurant. I'd show you pictures, but I was too busy drinking wine and eating good food to take any pictures; besides, Father RR took a vow that forbids being photographed. (OK, that last part might not be true; but it could be. Now you're wondering, right? Ha!) 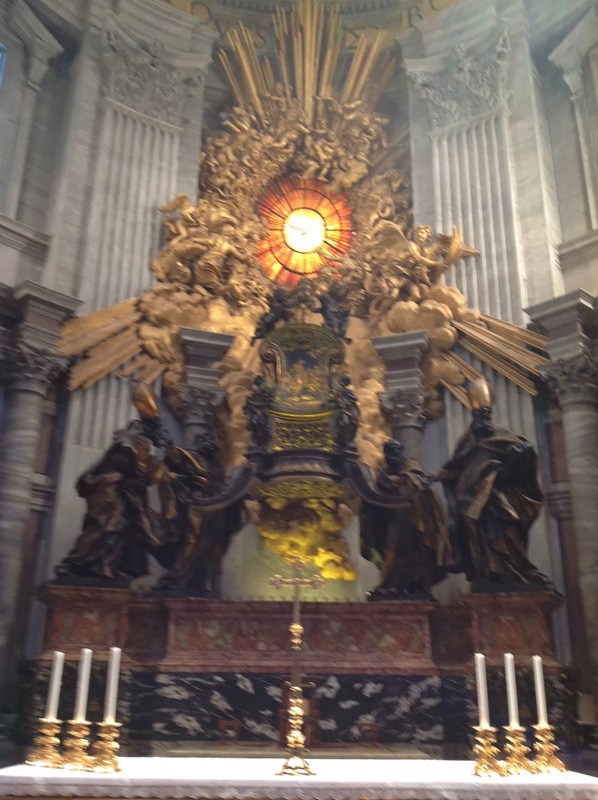 But as a consolation prize, I happen to have a closer photo of the Altar of the Chair, which I took this morning, as I was showing up for Holy Mass with the pope. Oh, yeah, I guess I forgot to mention that: the Vatican asked for priests in Rome to help out with holy communion at this Mass, so a number of us signed up. 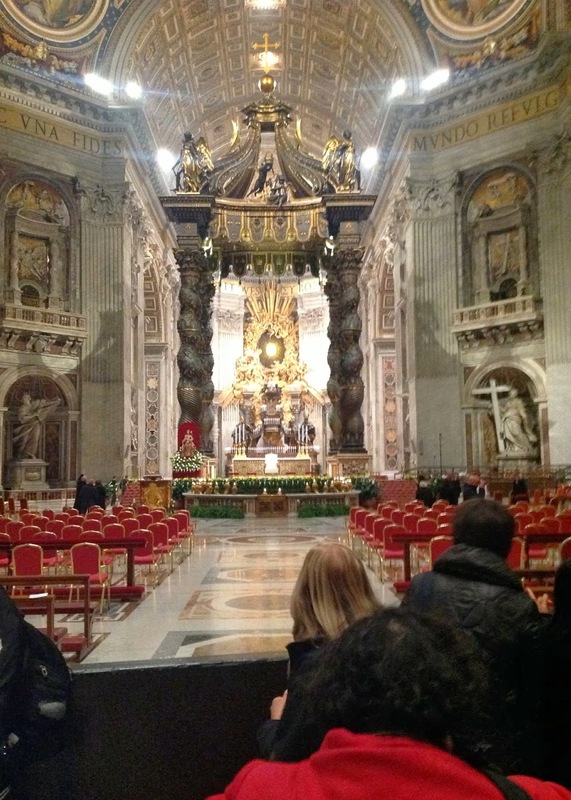 We arrived at the basilica around 8:30 (Mass was at ten), and made our way through as the choir was practicing. Afterward, I asked another priest, who understood Italian, what he said; and he summarized it in a few lines. 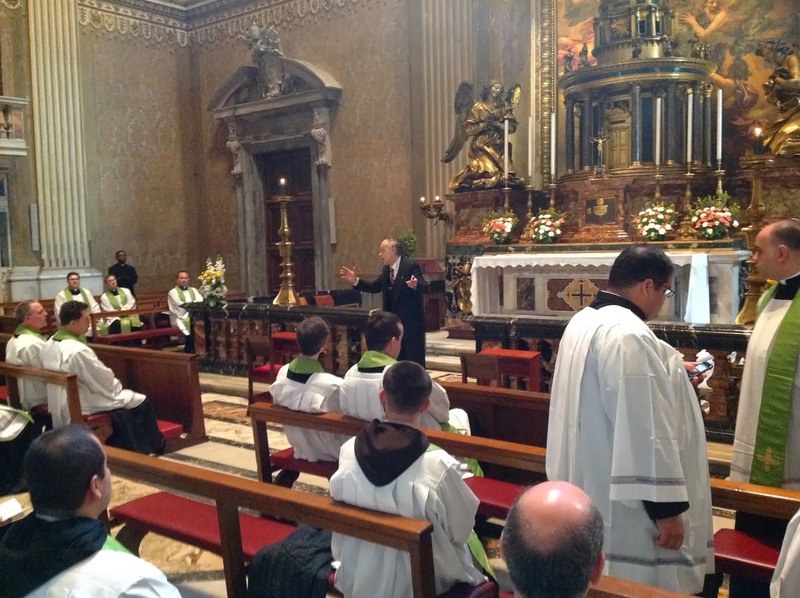 Then, a priest came in and spoke to us at some length, again in Italian. Afterward I asked my translator, what did he say? "Everything the other guy said." One of the things they told us was not to take pictures during the liturgy, and being American, I took that seriously and left my iPad in the chapel. Others, including priests with me, snapped away. We weren't concelebrants, I ought to explain, but simply there to help distribute holy communion. How does this work at a giant papal Mass, you ask? Here's how. The communion priests are all seated during the first part of the Mass. During the intercessions, we were all given bowls of unconsecrated bread; then, as the bread and wine were prepared at the altar, we were lined up to the side of the altar in four or five rows. If you were in the basilica, facing the altar, you would have seen us to the left. We were very close to the altar -- the closest I've been during a Mass. In fact, as I mentioned afterward to one of the priests, for that Mass, we were a kind of altar, as we were holding the bread as it was changed into the Body of Christ. Then, as the time for communion approached, we were led this way and that to take our stations. I was taken to a group of dignitaries nearby, then to several other spots, further and further back. We'd been told to give holy communion only on the tongue; so outstretched hands or not, that's what I did. At one point, a woman approached and was asking for something in Italian, I don't know what; one of the ushers shook his head and so I left him to handle it. After this, I took the hosts I still had back to the Blessed Sacrament chapel where it was reverently gathered up in a very large bowl, and the vessels were carefully cleansed of all remaining particles of the Lord. If you're wondering, as one of the priests did, what becomes of so large a quantity of consecrated hosts, my guess is they were distributed to area churches, where they would be distributed at Masses in the coming week. That's what happens in similarly large Masses in Washington D.C. for the March for Life, I was told one year. Don't stop reading now -- there's more! If you're wondering where the pope is, do you see the window with the red cloth hanging below it? 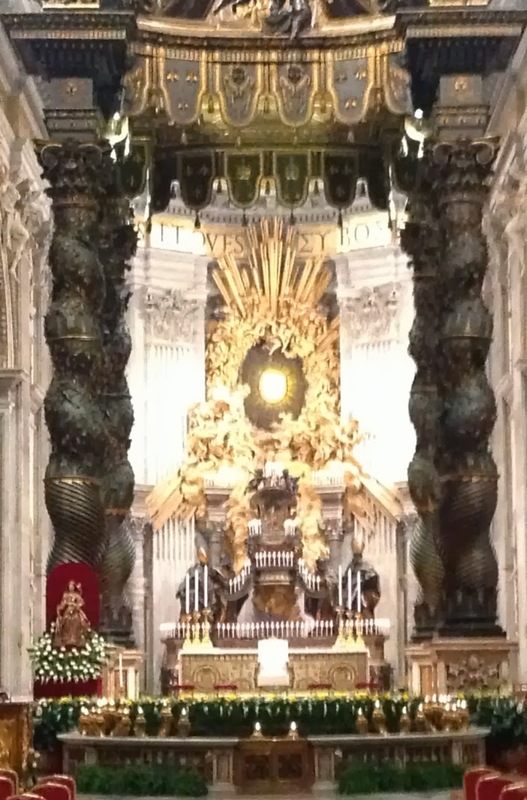 That's where the holy father spoke from. 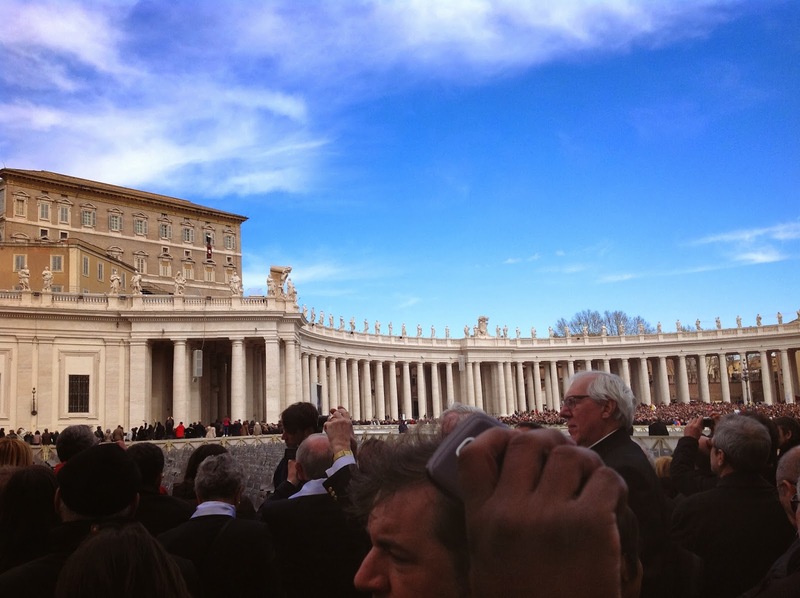 But they also broadcast it all on big screens in the piazza; so when he gave his blessing, lots of people bowed, not toward the window, where the Successor of Saint Peter actually was! ... but toward the video screens. Weird, but oh well. After this, our group found our way to a restaurant, had some prosciutto y melone, some pasta, some vino, and even though it broke the rules, cappucino. Then we found our way back up the hill, and I've been working on this post since! But I must stop now, as I have to get my room in order and get packed. Tomorrow, I fly to Malta! "Well, you know what he looks like. Anyway, here's a picture of everyone taking pictures:"
Reminds me of photo my father took many years ago in Washington DC of something seen all over town. Tourists. Keep the photos and commentary coming. Well-written as usual,Father, and very interesting. Glad you got so many pics. Malta should have lots of beautiful photo opportunities. The weather in Cincinnati is swinging back to cold and dismal again; soak up the sunshine while you can! ~ Rosemary A.